Read Part One. Read Part Two. It might seem, from the discussion so far in Parts 1 and 2 of this series, that effective gaming of the operational/strategy interface is infeasible. It is certainly the case that if the matter was approached using regular gaming methods, it may very well be. However, the importance of the issue in the real world demands an attempt be made to incorporate it into the overall gaming posture of the military as a whole, not to mention games run by the State Department and other national security organizations. To understand the prospects for incorporating the interface of levels, we must examine how something, whether a phenomenon, factor, issue, etc., can be addressed in a game. There are three ways: simulation, representation, and discussion. Simulation involves an attempt to recreate some aspect of reality as an aspect of the game. Certain things are understood well enough to be accurately modeled mathematically and simulated in computer programs. But the simulation approach can also be used when computer modeling is not possible or appropriate. A frequent instance in gaming is command and control. Where multiple command echelons are involved, human players act as commanders and staffs. The game designer attempts to create the essential elements of a C2 environment, including organization of player cells and communications equipment, such that in the course of a game the process of C2 unfolds in a manner sufficiently like it would in the real world to allow lessons to be learned that are applicable outside of the game. Such simulations can be very instructive, especially when new communications concepts or technologies are involved. The problem that commonly arises in games of this design is that such simulation occurs only on the Blue side. Red consists of a relatively small team of players that sit in a single seminar style cell, so C2 issues are obviated – not simulated. This introduces a profound asymmetry to the game irrespective of whether Red gets to engage in free play. Red can easily amalgamate strategy and operations in a way that is impossible for Blue. Creating a symmetrical C2 structure runs up against a number of feasibility issues. First is finding a sufficient number of Red players with the requisite knowledge of Red capabilities and doctrine. Second, simulating the cultural dynamics involved in foreign, multi-echelon interactions is normally beyond our intelligence capabilities. The third problem involves the inherent imponderables of free play at the strategic level. Even the real Red likely does not know what it would do in a crisis situation, and gaming experience has shown a reluctance of strategic level players to initiate hostilities on their own in a rational actor environment – with Red being played by U.S. personnel. All of this leads to the conclusion that the interface between the operational and strategic levels of war cannot be gamed via the simulation approach. Those things that are well understood or whose effects are relatively simple and straightforward are susceptible to being represented by a rule. An easy example from board gaming is a rule that reduces a unit’s (say an Army armored regiment) movement factor if it enters hexes (six-sided cells that overlay the game board’s map) that depict forests. This represents the difficulties that real world units experience moving through such terrain. Some phenomena are more difficult to represent by rules. An example is command and control (C2). For a board game the author had used to support his wargaming theory and practice class, C2 was represented by a budget metaphor. Players had fixed numbers of C2 points that had to be spent in order for their pieces to move or fight.1 Players did not have unlimited numbers so they had to make decisions on where to spend them. This simulated the pressures on a commander’s ability to focus. In other cases, again commonly in board games, a unit’s combat strength factor might be reduced to reflect deficient training or morale. In some cases, such representations can be useful, but the problem is that they are at best impressionistic – like the simple brush strokes an artist might use to represent foliage – and unable to capture what might be qualitatively different effects in different situations. A notable example of a game using a set of rules to represent political dynamics is Persian Incursion, a commercial board game that explores the consequences of an Israeli attack on Iranian nuclear facilities. In it a series of cards and look up tables produce a way to integrate operational actions and political effects. Its goal is not to determine whether Israel should attack Iran, it “… is an exploration of the consequences. What are the odds of it working? And what are the costs – to the attackers, the defenders, and everyone on the sidelines?”2 The game’s focus is limited, but the notion of superimposing a set of rules that provide a defined set of political inputs or outputs (rigidly assessed, in Francis McHugh’s terminology3) on an otherwise free-assessed operational game merits some consideration. The final approach to incorporating something into a game is simply talking about it. While this may not appear at first to be a gaming technique at all, there is ample precedent for doing so. A good example involves cyber warfare. There are any number of obstacles to subjecting it to either of the first two approaches, including it being highly complex, new, and not well-understood. However, in a series of deterrence games, the Naval War College brought in cyber experts to advise umpires on how cyber might be manifested in the assessment of player moves. Nuanced, qualitative judgments replaced rules and simulation as the mechanism by which the effects of cyber were inserted into the game. This seems to be a useful way that the complex, cybernetic interactions that characterize the interface of the strategic and operational levels of war can be incorporated into games. To understand and appreciate the utility of “talking about” the strategy/operations interface we can use a concentric ring framework similar to that adopted by Clausewitz for the purposes of what he called kritik, the historical analysis of battles and campaigns to arrive at a judgment of the relative merit of command decisions.5 We will proceed from an inside-out orientation. The beginning and most narrow focus is that of the individual game. We have already established the difficulty of trying to address, via representation or simulation, the interplay of the strategic and operational levels. To assess the worth of talking about the interface, we must first break down the potential purposes of games. Broadly speaking, they can be categorized as research, education, training, and influence, admitting nonetheless that any game can have multiple purposes and effects. Research games are conducted to learn something about a potential military situation that cannot be learned any other way.6 Educational games support teaching of some sort, most often the curricula of the military war and staff colleges. In the training realm, games tend to be substrates for the principal teaching objectives including weapons systems operations, staff procedures, tactics, etc. Influence games are conducted to create consensus on an issue, build teamwork, or convince external parties of the position the game sponsor holds on a matter. 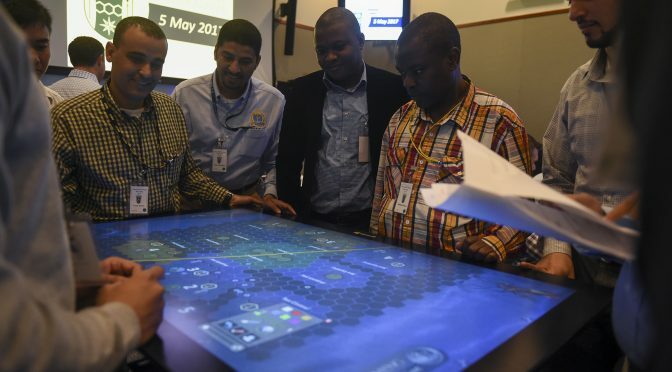 In training and influence games, any inclusion of the strategy/operations interface would likely constitute a distraction and serve to undermine game objectives. The role of the game as a substrate in training makes any auxiliary discussion of the interface irrelevant and superfluous. In influence games, unless the interface is central to game objectives, it would constitute a distraction and possibly interfere with the achievement of game objectives. The situation is fundamentally different for research and educational games. Research games, especially those that focus on the operational level of war, require a degree of plausibility to stimulate player buy-in and realism sufficient to establish an intellectual link with the real world. This is sometimes termed validity. Both of these attributes could be enhanced by the inclusion of the strategy/operations interface via discussion in all phases of game design, execution, and analysis. The interface should permeate the game as both enhanced context and direct influence on player decision-making. Sufficient attention to developing a “road-to-war” scenario, including discussions between scenario writers and political scientists, would tee up more nuanced play, including move assessments. A dedicated “interface” control cell could inject political considerations into the game as both guidance to umpires and injects to players, keeping the “whys” of the conflict as visible as the “hows” as the game unfolds. This cell would be well-placed to conduct an end-of-game session on the direction of the conflict beyond where the game ended, otherwise described as the “then what?” question. The research insights and lessons learned would be colored and enhanced by doing this, and its demands on time and manpower would be manageable. The main ingredient would be an organizational commitment to the idea that the interface matters. The inclusion of the interface in educational gaming would use a similar approach, to include a more completely thought-out road-to-war scenario, an interface-oriented control cell, and a “then what” session included in the hot wash. The discussion approach might also benefit from iterative gaming. Using the methods just discussed, a series of games featuring the same general scenario but with different “strategies” adopted by control would allow analysts to see how different sets of presumed political conditions and dynamics could affect approaches to military operations. However, due caution must be exercised if different players and methods are used in each game. Nonetheless, patterns may emerge that could provide valuable insight into the potential dynamics of the strategy/operations interface. There are a number of reasons that the exploration, via gaming, of the strategy/operations interface may not yield directly actionable insights. Any game conducted in peacetime can only speculate on why a war would start, thus making gaming of the interface across the span of that conflict equally speculative. Moreover, the intellectual complications Clausewitz discussed are always present, further clouding any predictive value the game might have. However, well-run games can have indicative value; that is, they can reveal possibilities. But even in this realm, the narratives that emerge from gaming the interface cannot be directly distilled for principles. If this is the case, what value is obtained from the cost and effort of including the strategy/operations interface in gaming? The value of gaming the interface is admittedly indirect, but nonetheless real. It would be manifested in the minds of game participants and eventually in the corporate reflexes of the national security enterprise. If the interface was routinely incorporated into the appropriate games, over time, individuals would start to reflexively consider it in their real-world tasks, whether developing plans, policy, or making real-time decisions. In the best case, experience in such gaming would inoculate practitioners and policymakers against mystical, “sure fire” concepts of wa and perhaps keep them from yielding to emotion in the heat of conflict. In this sense, it is like superimposing an influence game on a research or educational game. Professor Emeritus Rubel is retired but serves as an advisor to the CNO on fleet design and architecture. He spent thirty years on active duty as a light attack and strike fighter aviator. After leaving active duty he joined the faculty of the U.S. Naval War College, serving as Chairman of the Wargaming Department and later Dean of the Center for Naval Warfare Studies. In 2006 he designed and led the War College project to develop the concepts that resulted in the 2007 Cooperative Strategy for 21st Century Seapower. He has published over thirty articles and book chapters dealing with maritime strategy, operational art and naval aviation. Peter Perla and Michael Markowitz, Wargame Construction Kit, a one-off game produced at the author’s request. Larry Bond, Chris Carlson, Larry Dougherty, Persian Incursion, Rule Book, (Sassamansville, PA: Clash of Arms Games, 2010) p. 4. Francis J. McHugh, The Fundamentals of War Gaming, Third Edition, originally published 1966,(Washington, DC: US Government Printing Office), p.14. Robert Rubel, “Connecting the Dots: Learning from Multiple Wargames,” Phalanx, December 2016, (Arlington, VA: Military Operations Research Society). Clausewitz, Book Two, Chapter Five, p. 156 for a general explanation and pp. 159-161 for an example of his widening circle analysis concerning his moves in the 1797 campaign leading to the peace of Campo Formio. Robert C. Rubel, “The Epistemology of Wargaming,” Naval War College Review, Spring 2006, (Newport, RI: Naval War College Press), p. 111.